In a previous article, we have ever discussed about the differences between Canon EOS M3 and Sony a6000. This time, however, we are going to discuss about Canon EOS M3 and Sony a5100. In many ways, Sony a5100 is often considered as a budget variant of Sony a6000. What makes this comparison even more interesting is that Canon EOS M3 and Sony a5100 is priced almost similarly. Thus, no wonder that a lot of people are finding difficulties in choosing between these two mirrorless digital cameras. Which one is better? 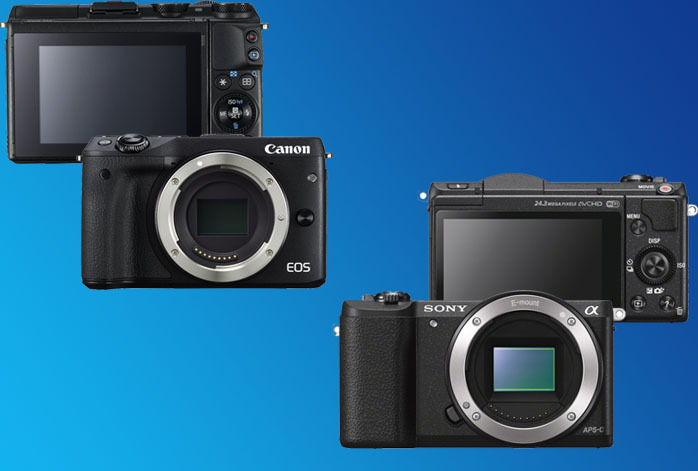 Even though both models come with 24 MP APS-C CMOS image sensors, Sony a5100 has slightly larger pixels than Canon EOS M3. A larger pixel area usually translates into better color depth and dynamic range. And this is true for the case. While both cameras deliver similar image sizes, more or less, Sony a5100 is able to delineate more strong, accurate colors. Shadows and light are also depicted better. Both models support AE Bracketing, a feature that is very useful in tough lighting conditions as well as in HDR photography. The feature allows the camera to snap multiple shots very quickly with different exposures, in order to capture all the colors and details of all the objects at various distances. However, Sony a5100 has a wider AE Bracketing range than Canon EOS M3. The AE Bracketing range of Sony a5100 is up to plus-minus 3EV, while the AE Bracketing range of Canon EOS M3 is only up to plus-minus 2EV. With a wider AE Bracketing range, your camera will be able to capture more accurate colors and details. For shooting fast-paced actions and sports, there are a number of factors that come into play. Usually, you would need a high continuous shooting speed. Sony a5100 offers a pretty good photo burst of 6 fps. Not among the best, but still pretty good. Canon EOS M3’s is only 4.2 fps. In addition, Sony a5100 boasts an astonishing number of focus points, totaling 179 focus points, with phase-based and contrast-based movement detections. Canon EOS M3 only has 49 focus points. Simply, Sony a5100 is more reliable for tracking moving objects and delivering more fine details into the images. Canon EOS M3 is not without any advantage. Each model comes with a built-in flash, but only Canon EOS M3 that has an external flash shoe. Also, Canon EOS M3 has an electronic viewfinder and a microphone port, two things that Sony a5100 lacks. Last but not least, Sony a5100 has a larger RAW buffer capacity than Canon EOS M3 (25 shots vs. 4 shots). Though Canon EOS M3 has an unlimited JPEG buffer capacity, Sony a5100’s 67 shots should be sufficient. Even though Sony a5100 has a number of advantages over Canon EOS M3, the lack of a viewfinder can be a great issue for some people. If you are sure that you can do well without a viewfinder, then you should choose Sony a5100. Otherwise, Canon EOS M3 is the way.